Dunoir Fishing Adventures would like to wish all of our friends and guests a warm welcome into 2016! 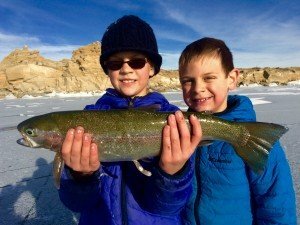 We have started fishing off right in the Wind River Basin taking advantage of the cold temperatures and good ice, making for safe fishing. 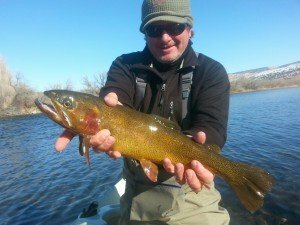 This last fall our fishing guides were busy, busy guiding on the Bighorn and Green Rivers, hence the lack of guide reports. 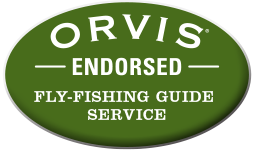 Our New Year’s resolution is to keep up with reports so that you can be more informed on fishing conditions. We have a lot in store for 2016. 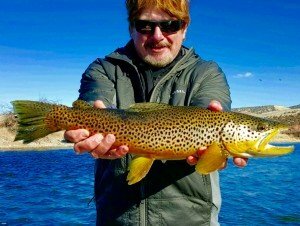 Our guides are looking forward to being on the water with the Project Healing Waters-Platte Rivers Chapter and Wyoming Casting for Recovery in Dubois, Wyoming. These days on the water are some of the most memorable and special for our guides. We are blessed to be apart of these programs! 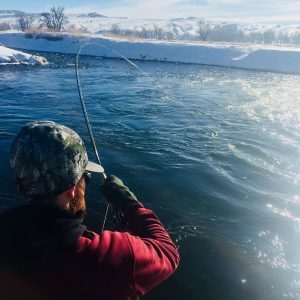 Winter Fishing Report: Bighorn River Thermopolis, Wyoming: The fly fishing on the Bighorn has been incredible the last couple of weeks. The key factor has been our warm temperatures and lack of the evil “W” (wind). Our guide, Jeff Judkins, was out the past three days with Ed. The boys where successful catching the trout grand slam: Rainbows, Browns, and Cutthroat trout. Ed not only earned grand slam status, but he caught some bruiser big trout to boot! Thanks Ed for the great time. Winter is the perfect time to drift boat fish the river due to fewer crowds, great fishing, and and beautiful landscape blanketed in snow. For hot flies think small midge patterns. In the winter every day is different, so changing out flies is a must. 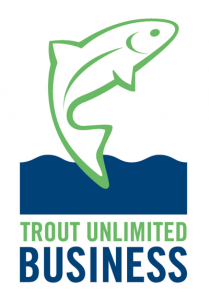 We are still offering our winter discounted trips for $380 for one angler or two.